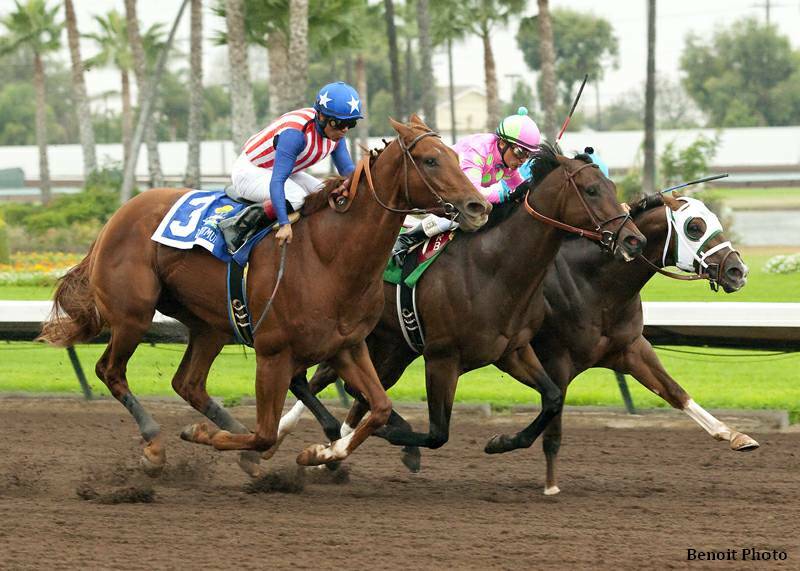 By the margin of his game chestnut head in Saturday's Los Alamitos Futurity, Dortmund became the first Grade 1 winner for his sire, champion and classic winner Big Brown (by Boundary). Now unbeaten in three starts, Dortmund is the best racer yet to represent his famous sire and is from Big Brown's third crop of foals. For 2015, Big Brown has moved from Kentucky and will stand in New York at Duchess Views Farm. Before Dortmund, the best racer by Big Brown was probably his first-crop leader Darwin. A fetching individual, Darwin became the sale-topping juvenile of 2012 when selling for $1.3 million at Fasig-Tipton's Florida sale to Demi O'Byrne for a Coolmore partnership. After winning a maiden at Belmont and finishing unplaced in the Remsen as a 2-year-old, Darwin has raced overseas, where he is a listed stakes winner and also managed to finish third in the G1 Sussex Stakes this summer. A big and brawny chestnut, Dortmund is at least as handsome as Darwin, but the Futurity winner came from his sire's third crop, when the shine was well off the stallion's progeny, and Dortmund brought only $140,000 at Fasig-Tipton's Midlantic sale of juveniles in training earlier this year. He was sold by Breaking Point Farm. Donato Lanni, agent, signed the ticket for the grand-looking colt, who races for Kaleem Shah and is trained by Bob Baffert. Were they surprised to get such an impressive prospect for such a moderate price? Possibly, and well they should have been. Dortmund sped a furlong at Timonium in :10 1/5, which was quick enough, but he did it with a stride of more than 26 feet. That was more than three feet longer than the average stride at the sale, and those of us who could appreciate the colt's accomplishment were truly agog. Dortmund was one of the longest-striding horses of the juvenile sales season, and he has powered on to become a G1 winner by the end of the year. Bred in Kentucky by Emilie Fojan, Dortmund is out of the Tale of the Cat mare Our Josephina. Dortmund was an $85,000 RNA as a weanling at Keeneland November, then a $90,000 yearling at Fasig-Tipton July last year, before his sale in Maryland in May. The colt's dam won the listed Ohio Valley Handicap at Mountaineer as a 4-year-old, then ran second in the G3 Chicago Handicap at Arlington Park. With three victories in 14 starts, Our Josephina earned $180,584. Bred by the late George Brunacini and Bona Terra Farm, Our Josephina was the best performer from her dam, the richly pedigreed Ropa Usada. A daughter of the great sire Danzig and champion filly Lakeville Miss, Ropa Usada was unraced. As a yearling, Ropa Usada went through the ring at the Saratoga select yearling sale for $900,000, with Luca Cumani, agent, signing the ticket. As a 6-year-old carrying her third foal on a cover by Lion Cavern, Ropa Usada sold for about $115,000 at Tattersalls December sales in 1995. Two years later, she was an RNA at $270,000 when carrying a cover by Kingmambo, and Brunacini bought the mare for $30,000 at Keeneland January in 2000. Ropa Usada had not been represented by a winner at the time of sale, but the foal she was carrying became Our Josephina. Although three of Our Josephina's five previous foals are winners, Dortmund is the one who really matters. He has shown the panache and power of an outstanding horse from his works at the 2-year-old sales, and Dortmund is the best racehorse from this family since his third dam, champion Lakeville Miss (Rainy Lake). An outstanding juvenile, Lakeville Miss won the Matron, Frizette, and Selima Stakes at the G1 level as a juvenile, and she followed up her Eclipse Award with victory in the G1 Coaching Club American Oaks at 3, along with seconds in the G1 Acorn and Mother Goose. A very muscular and good-looking mare, Lakeville Miss had very bad luck as a broodmare, with only five live foals from 13 years at stud. She twice was reported to have slipped twins, and the mare was reported to have slipped a third time and barren four times, which may have been the result of further twinning trouble. One of the problems for mares who readily conceive twins is that their attending veterinarians frequently try to manually abort one conceptus very early. The mare has to be checked by ultrasound to confirm the presence of two, and then the vet can try to reduce that to one. This has hazards, of course, including the loss of both, but very few Thoroughbreds carry twins to term. Despite her problems with producing foals, Lakeville Miss was a producer of high class. Her best racer was G1 winner Mogambo (Mr. Prospector), a horse of great beauty and nearly equal ability. Mogambo won the Champagne Stakes at 2, then the G2 Gotham at 3, and was second or third in five more G1 races. And in Dortmund, this family has perpetuated the tradition of beauty and great ability that propelled Lakeville Miss to the top of her class. This entry was posted in Bloodlines Archive and tagged Big Brown, bloodlines, Bob Baffert, Breaking Point Farm, Darwin, Donato Lanni, dortmund, Emilie Fojan, fasig-tipton, Fasig-Tipton Midlantic, Fasig-Tipton Midlantic 2-year-olds in training, Frank Mitchell, Lakeville Miss, los alamitos futurity, Mogambo, Our Josephina, pedigree analysis, Tale of the Cat, thoroughbred pedigrees by Frank Mitchell. Bookmark the permalink.